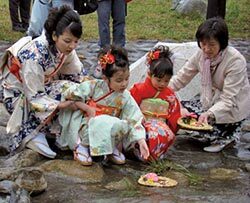 In Japan, families and communities hold Hina-matsuri, or the Doll Festival, on March 3 every year to wish good health and future happiness for girls. 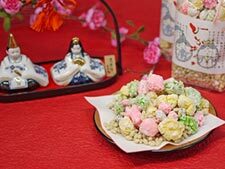 Each family sets up a display of hina dolls clothed in colorful kimono and the whole family enjoys eating delicious food. Peach blossoms, which bloom in spring, decorate a set of dolls arranged in tiers. The festival is celebrated not only within the family but in communities, which each have their unique ways of celebrating the occasion. The colorful and happy mood of the festival covers the whole country. It is said that Hina-matsuri has its origin in the ancient custom of nagashi-bina, or putting bad luck on the backs of paper dolls and letting them flow down the river. As this is the time when the seasons change from winter to spring, people wished that by doing so, they would be able to keep away illness and enjoy good health. Over the years, this ancient custom was mixed with the game of playing with dolls, which was enjoyed in wealthy families. During the early years of the Edo period (1603-1868), Hina-matsuri was born as it is practiced today. In the past, the festival was also a day to thank women busy working for the family. This was a day when women could enjoy themselves, doing nothing and eating delicious fare. 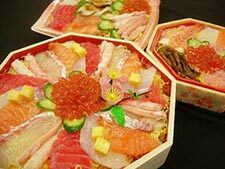 Even today, families celebrate the day by serving hina-arare (colorful pellet-like rice crackers coated with sugar), hishi-mochi (diamond-shaped layers of colorful, thin rice cakes), and chirashi-zushi, (sushi rice mixed with colorful ingredients suitable for the occasion), and other traditional food.